Swartzia pinnata stamens are dimorphic: many standing ones in front of a petal and two forwarded ones. 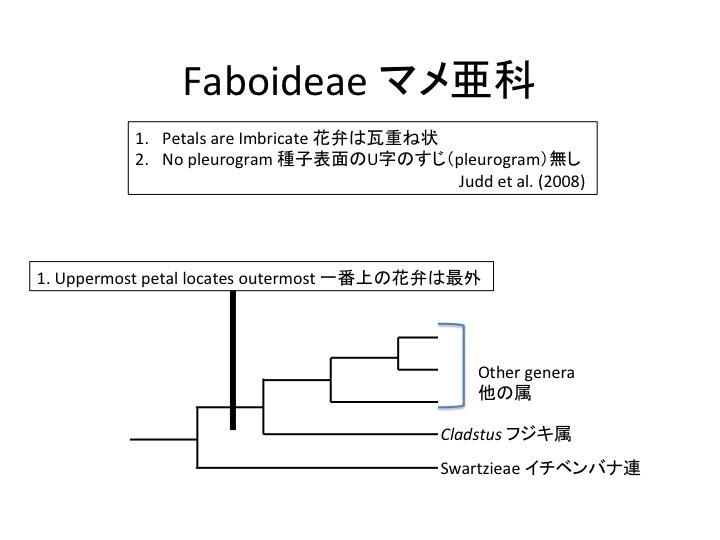 Both stamens originate from the same primordium （Tucker 2003). The former stamens function as feeding stamens for bubble bees and the lower ones function in pollination (Endress 1994). Pollen of feeding stamens are sterile and 2/3 the size of fertile pollen. 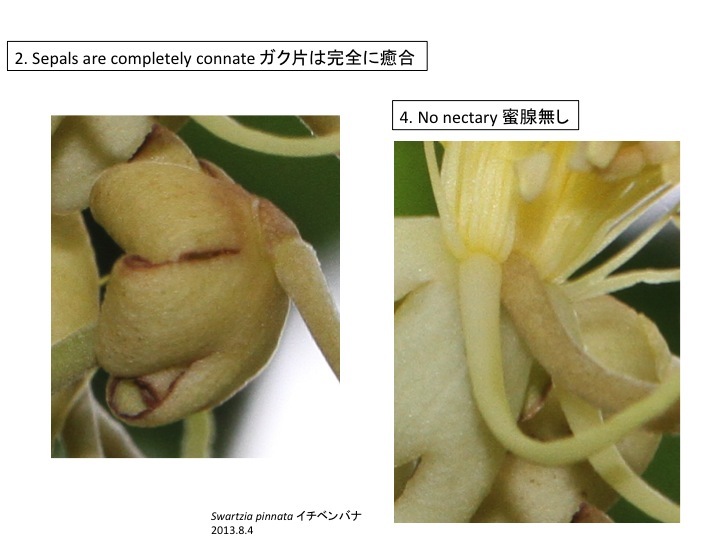 The decrease of the number of petals may be related to the increase of the stamen number. Baker, H.G. 1978. 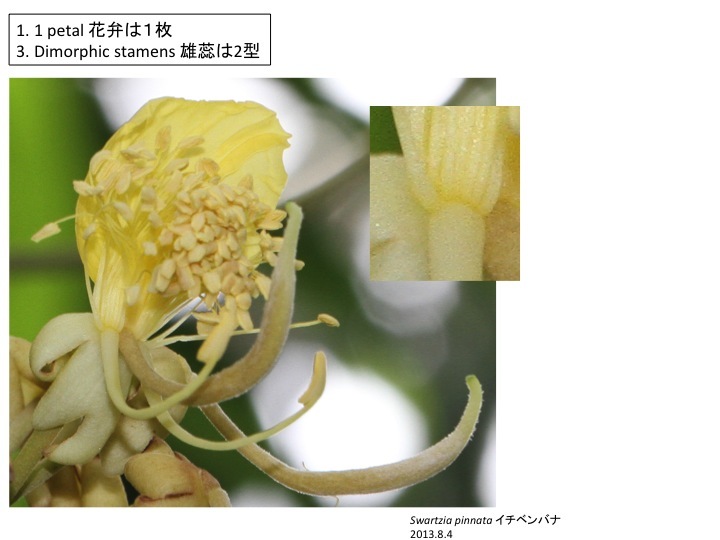 Chemical aspects of the pollination biology of woody plants in the tropics. In Tomlinson,P.B. and Zimmermann, M.H. (eds), Tropical Trees as Living Systems, 5 7-82. Cambridge Univ. Press. Endress, P.K. (1994) Diversity and Evolutionary Biology of Tropical Flowers. Cambridge Univ. Press. Tucker, S. C. 2003. 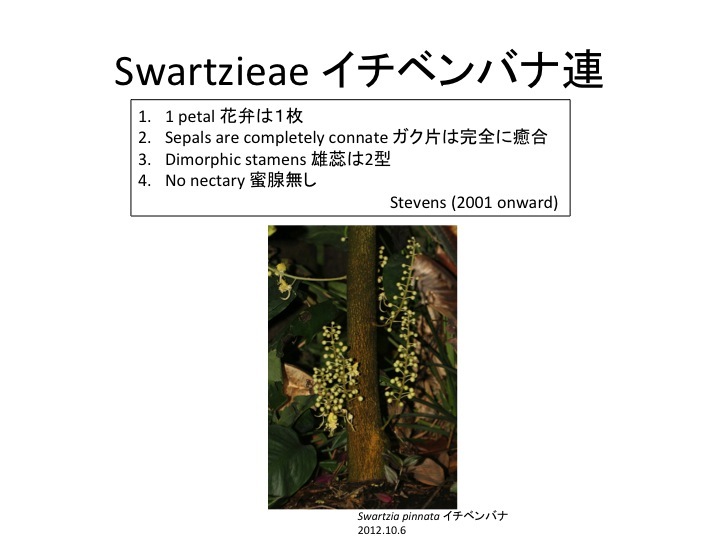 Floral ontogenyin Swartzia (Leguminosae: Papilionoideae: Swartzieae): distribution and role of the ring meristem. Amer. J. Bot. 90: 1271-1292. Torke, B.M. and Schaal, B.A. 2008. 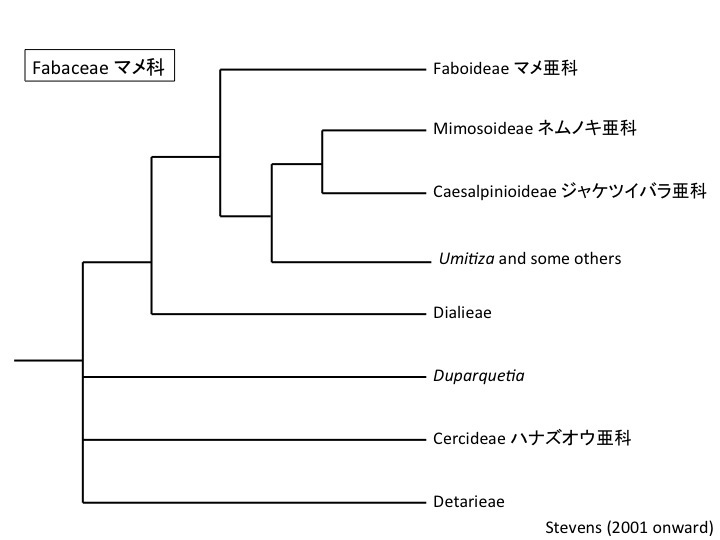 Molecular phylogenetics of the species-rich neotropical genus Swartzia (Leguminosae, Papilionoideae) and related genera of the swartzioid clade. Amer. J. Bot. 95: 215-228.